Between 2013 and 2016 the War Museum was part of the European project Mesch (Material Encounters with digital Cultural Heritage, http://www.mesch-project.eu). MeSch has the goal of designing, developing and deploying tools for the creation of tangible interactive experiences that connect the physical dimension of museums and exhibitions with relevant digital cross-media information in novel ways. The meSch approach is grounded on principles of co-design: the participation of designers, developers and stake-holders into the process of creation and evaluation as equal partners, and on a Do-It-Yourself philosophy of making and experimenting. The meSch consortium consists of twelve partners from six European countries and is coordinated by Sheffield Hallam University. The project – funded by the European Community’s Seventh Framework Programme “ICT for access to cultural resources”. Role of the War Museum was to collaborate in the testing of new technologies to communicate with visitors and gather information on the effectiveness and applicability of the devices prepared by the project. 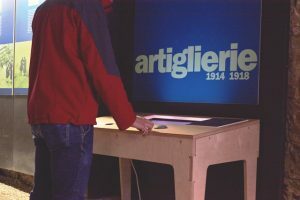 In the room dedicated to the events on the Italian-Austrian front of 1918 was positioned an interactive case that provides the opportunity for visitors to come into direct contact with some original objects and receive more information. Touching and interacting with objects and actually belonged to soldiers of the Great War, the audio and video contents are activated; the videos provide information on how these objects were produced and what function they had. The showcase was designed and realized thanks to the collaboration between the Museum, the company eCTRL Solutions and the Bruno Kessler Foundation in Trento. The second trial took place between October 20 and November 14, 2015 at the artillery section of the Museum. In 2016 it was made a revision of the technologies and installations are made permanent. With devices developed by Sheffield Hallam University and Fondazione Bruno Kessler the Museo della Guerra has been able to enhance their tour for visitors by offering in-depth information on the impact of a fort built by Austro-Hungarians on the eve of the Great War on the inhabitants of the region. The focus of the exhibition is on telling stories of inhabitants’ lives using meSch technology in order to increase the awareness of the importance of cultural heritage of small communities. The aim of this interactive exhibition is to complement factual information (offered by the museum through guiding material, captions, panels and photos) with digital information related to personal stories, making the visitors feel involved in an emotional experience. The case study took place in the Artillery section of the Museo della Guerra, located in an air-raid shelter from the Second World, that was excavated into the hill over which the museum castle was built. The topic of the case study is fort Pozzacchio, an Austro-Hungarian fortress of the First World War: the fort was realized by the Austrians starting from 1912; it was entirely dug out of the stone and in the last years it was the subject of a large restoration operation. 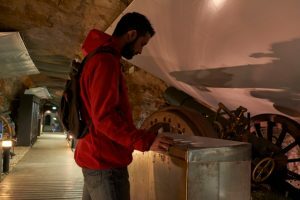 Within the Artillery section, by means of 4 interactive installations placed alongside the cavern, the visitor was given the possibility of listening to the voices of various people who worked or fought in the fortress and whose lives had been somehow influenced by the constant presence of the fort. At the entrance visitors receive an activating object (a ‘pebble’) that they can use to activate content at the interactive stations in the exhibition. The visitors can choose which story to listen to and also the order in which stories are heard. The “pebble” was designed to be small and easy to handle. It contains NFC technology in order not only to activate the interactive stations but also to collect and log data on the stories that the visitors choose to hear. Each station has multiple personal stories on the same theme. The stories are drawn from diaries or memories written during the wartime years or from oral witnesses’ accounts made over the distance of time. The narrations are introduced in chronological order. We chose to present the content to visitors in different ways according to the place where the stations are located: videos without audio, audios with or without the support of images and videos of actors performing in scene costumes. The check-in station serve as an introduction to the exhibition to allow an immediate connection between what visitors have seen in the museum and the specific historical topic they are going to encounter in the exhibition at the Artillery. At the second station the narration was concentrated on the particular construction of the fort; the visitor can choose from 5 narrations by people who worked at the fort. The third station is dedicated to the voices of the civilian population and to the impact of the fort on their lives. 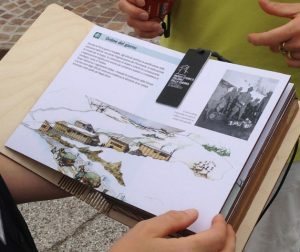 At the fourth interactive station we decided to use diaries of soldiers from the opposite armies talking about the same battle that took place in fort Pozzacchio. To reproduce an atmosphere of intimacy and to create a straight connection between visitors and witnesses, we asked the actors to perform while looking into the camera. When leaving the visitors hand in the ‘pebble’ at the check-out station and receive a personalised postcard. A final sentence invites visitors to connect to the museum website to find the stories and the bibliographic references of the original documents from which the narrations where extracted. The goal was to reinforce their positive attitude towards the experience, favor memory and sharing, and enable further curiosity and exploration. 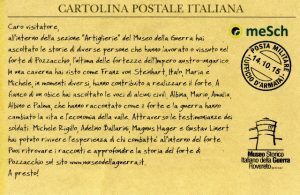 More info about the postcard on the post on mesch website. From the 20th of October to 14th of November 2015 a visitor evaluation study took place. The general research questions concerned the combination between digital information and museum spaces with “difficult” physical environment; the adequacy of digital content to create immersive experiences that preserve the central role of a cultural site with a strong physical and historical identity; the possibility to use tangible interaction to favour a personal connection and involvement with the exhibition; the effectiveness of the tangible interaction in shaping the experience for small groups. The Companion Novel, a multi-point auditory narrative system, was designed by the meSch team at Sheffield Hallam University for amplifying the emotional and interpretative dimension of the visit of outdoor heritage sites with particular historical and emotive values. We tested it in a field trial at the trenches of Nagià Grom from the 21st-25th July 2014. The Companion Novel prototype is based on an interactive book-like device that visitors carry with them while walking the ground; the book is complemented by a set of Blue-tooth speakers located at points of interest (hotspots) and used to play relevant content. The content is location-dependent and is organized into different thematic threads that the visitor can select by changing the position of a bookmark in between the pages of the book. Each page of the book corresponds to a different genre/theme or story related to the WWI trenches of Nagià Grom, such as; camp regulations, letters and diaries from the trenches, war as seen through the eyes of women and poems. The design team in Sheffield finalized a revision of the design concept in its form to come up with an alternative companion device carried by visitors more suitable for the trenches. 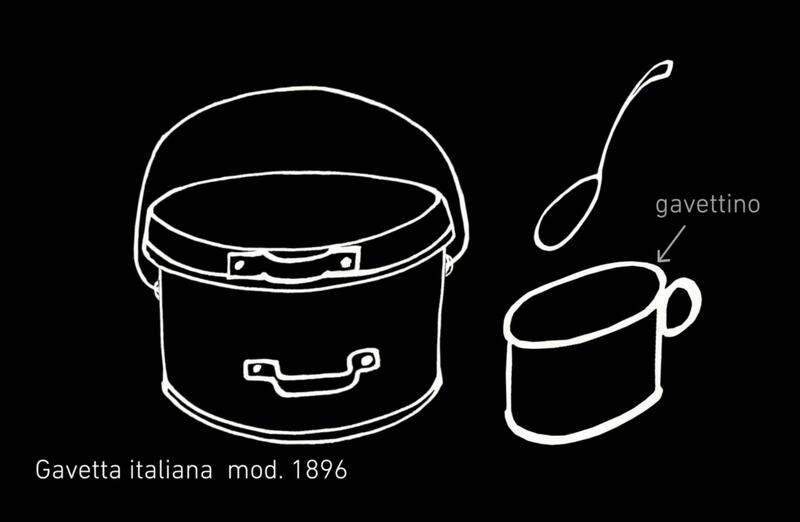 This second version of the system features a different encasement for the companion device carried by the user, a belt with multiple pockets. 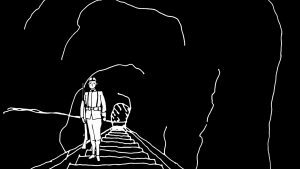 The belt was inspired by WWI military cartridge belts and disguises the technology for tracing visitors’ proximity to the lanterns and choosing the most appropriate content to play. The theme selection, that in the book was supported by the bookmark is here supported by illustrated cards augmented with NFC tags that can be inserted in and slid into one of the belt pockets. Both the book and the belt-based versions of the system were tested in the field tests at Nagià Grom. 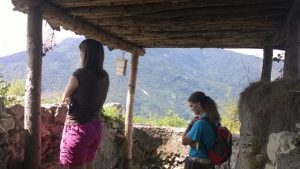 "Voices from the past in fort Pozzacchio"